Fetal heart rate monitoring measure the fetus’ heart rate and rhythm, letting the healthcare provider see how the fetus is doing. Abnormal fetal heart rate may indicate that the fetus is not getting enough oxygen, or that there are other problems. However, with a false-positive rate of 89 percent for predicting fetal distress, questions are raised regarding its efficacy and outcomes. Fetal heart rate is not a direct measure of fetal brain oxygenation, and cannot accurately and reliably predict the risk of fetal asphyxia. The Texas-based startup Noninvasix has developed a safe, accurate and noninvasive monitoring system of fetal welfare during labor and delivery. The novel system use optoacoustic technology to measure cerebral venous blood oxygen saturation in fetuses in real-time during late-stage labor, enabling physicians to recognize if a fetus in distress and take immediate, corrective action. A tiny probe is inserted transvaginally and placed on one of the baby’s soft spots. Near infrared light pulses are sent into the brain’s superior sagittal sinus where hemoglobin in the blood absorb the light at different frequencies, based on whether or not it is carrying oxygen. Absorption causes thermal expansion of hemoglobin, resulting in an acoustic wave. Software then analyze the acoustic signal to give an accurate measurement of oxygen saturation. The prototype has been safely tested in adults, fetuses and neonates, and clinical tests show that the system provides accurate measurement of oxygen saturation in the superior sagittal sinus. While the initial application of the technology is used in monitoring fetal health, it can also be used in a wide variety of biomedical applications. 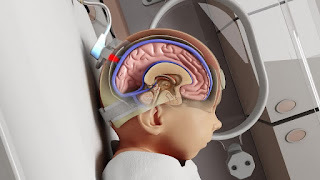 Noninvasix has demonstrated that the system can detect cerebral ischemia in premature newborns, monitor brain ischemia in traumatic brain injury, and according to the startup’s website, they envision the use of optoacoustics in many related issues. The innovative solution give a more accurate and reliable measurement of brain oxygenation, ultimately lowering the incidence rate of cerebral palsy and unnecessary C-sections, saving over $5.4 million in healthcare expenses in the US alone. Many doctors face enormous malpractice claims because of the inaccuracies of fetal heart rate monitoring, and Noninvasix show great potential in helping doctors make better decisions, giving better health outcomes. By giving better health outcomes to both babies and mothers, the technology also provide significant value to doctors, hospitals, as well as insurers. Noninvasix was a semi-finalist in the SPIE Startup Challenge 2016, and was selected as one of the finalists of the HITLAB World Cup, an international competition that promotes original solutions for pressing healthcare challenges.